This post is sponsored by Nature Valley™. 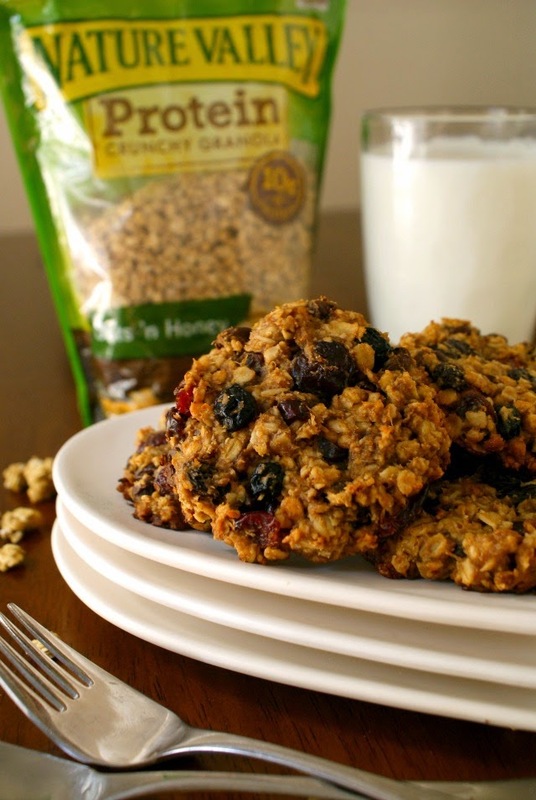 Granola Breakfast Cookies are soft, thick, protein-packed cookies that are studded with chocolate chips and dried fruit. They are a delicious and healthy way to start the day, made with no flour, no eggs, no butter, and no oil. Breakfast options that are nutritious, delicious and convenient for weekday mornings have been on my mind lately. Our morning schedule is busy, busy, busy as we adjust to our new school-day routine. That routine includes getting myself, my kindergartner, and my boisterous (almost) 2-year old fed, dressed and on the road earlier than we're even used to getting out of bed in the morning. Challenging, to say the least. While I'm the kind of Momma that likes to make blueberry pancakes and buttermilk waffles from scratch, that's just more than time will allow nowadays. Instead, I'm opting for less time consuming options, like fresh fruit, yogurt, whole wheat toast and breakfast cookies. Wait, what? Breakfast cookies? I'm sure that's what you're thinking right now, right? I honestly never thought I'd put the words cookie and breakfast into the same sentence. The two words sound like a contradiction of terms if you ask me. In our house, cookies are a special once-in-a-blue-moon kind of treat. And they're certainly not for breakfast. These babies are surprisingly very breakfast-worthy and full of all the good stuff that comes to mind when you think of a nutritious breakfast. 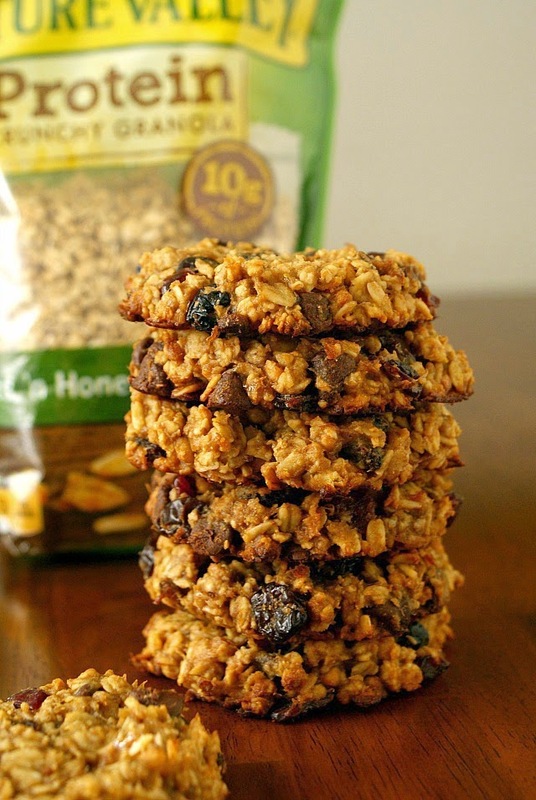 Crunchy granola, rolled oats, bananas, dried fruit...it's all in there. Do you know what's not in them? Most of the things that you would think of when you think of basic cookie ingredients. That means no flour, no eggs, no butter, and no oil. 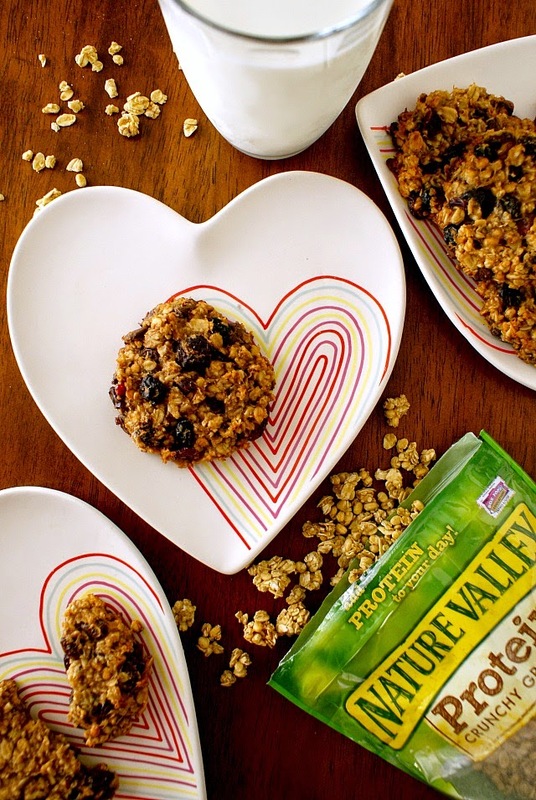 It seems almost impossible, yet these Granola Breakfast Cookies are totally soft, incredibly tasty and have a nice punch of protein from the Nature Valley™ Protein Granola and the peanut butter. You can even customize your cookies to suit your tastes. Swap out some of the dried fruit or chocolate chips with chopped peanuts, chopped almonds, shredded coconut, or pumpkin seeds! Make them your own and start the day off right! Preheat your oven to 325 degrees. Line a baking sheet with parchment paper. 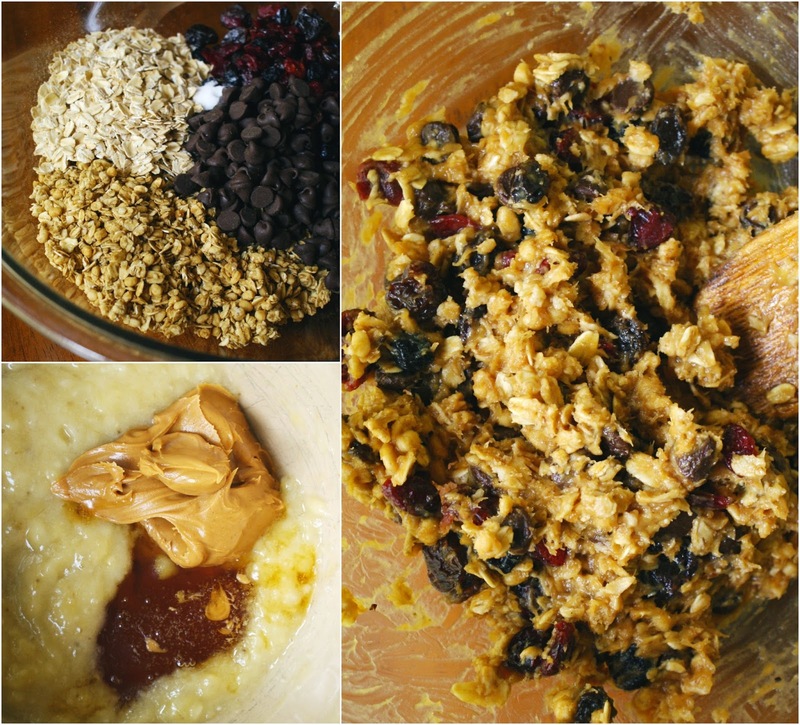 In a large bowl, combine the granola, oats, dried fruit, chocolate chips, cinnamon, and salt. In a medium bowl, combine the mashed banana, peanut butter and honey. Add the wet ingredients to the dry ingredients and stir with a large spoon until well mixed. Using 1/4 cup of the cookie mixture for each cookie, spoon the mixture onto the parchment-lined cookie sheet. Shape and flatten the cookies with your spoon. They should be about 1/2-inch thick. Keep in mind that they're not going to spread when you bake them. Bake in the preheated oven for 15-17 minutes or until the edges start to turn golden. Let the cookies cool on the baking sheet for at least 5 minutes before moving. I have made these with the cinnamon (which is how my daughter preferred them) and without (which is how I preferred them). You can store these at room temperature, but I prefer eating them cold right out of the fridge. Either way, store them in an air-tight container for up to one week. Disclosure: This post was sponsored by Nature Valley™ through their partnership with POPSUGAR Select. While I was compensated to write a post about Nature Valley™ Protein Granola, all opinions are my own. 1/2 cup Nature Valley™ Protein Granola provides 10 grams of protein and 22-26 grams of whole grain, at least 48 grams of whole grain recommended daily. Ack! Sorry about that. I edited the directions. There is NO flour in this recipe. i think these look great i will be trying with a bulk granola, but calling these a no-sugar baked good is a misleading. the second ingredient in the granola is sugar. I only meant that I did not add any granulated sugar to the recipe. I never meant to be misleading! I'm happy to edit the post. There is sugar and oil in the granola! Hello! This is extremely misleading. I only meant that I did not add any granulated sugar or oil to the recipe. I never meant to be misleading! I'm happy to edit the post. Awesome! I hope she likes them. Could you swap out the honey for Agave? I'm not sure. I haven't used Agave before, so I can't speak to how it would work in this recipe. Hi Valerie! The first ingredient on the ingredients list is 1 1/2 cups of Nature Valley Protein Granola. Is it not showing for you? I am looking forward to trying these with my 4 year old. I think we will both enjoy the making and eating of these breakfast cookies... :-) thank you for sharing. I hope you and your little one enjoy them! Thank you for your awesome recipe. I really don't want to use chocolate chips in my breakfast cookie; could I substitute additional fruit? Thank you for your recipe. I love cookies, so having them for breakfast is perfect for me. I did add additional fruit instead of the chocolate chips and 2 scoops protein powder. This morning I'm going to try using applesauce instead of the bananas. Great idea to add the protein powder! The cookies were delish using the applesauce. My co-workers asked for me to make these more often! Oh, wonderful! I'm so glad to hear that the applesauce worked out. I'll have to try that! Can I ask how much applesauce you used? I have the single serving cups and was debating how many to use per the recipe to replace the bananas?